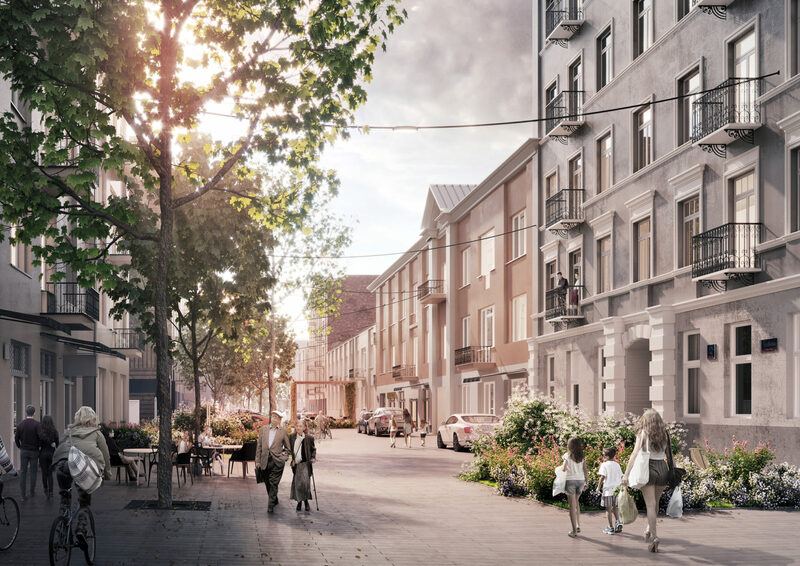 The main objective of the planning concept at Środkowa Street is creating a woonerf, a pedestrian and traffic path with pedestrian and bicycle traffic priority. A woonerf is a “living street”, a public realm, an urban courtyard, where pedestrians, cyclists and road users can peacefully coexist. The townhouse inner courtyards that are so typical of the Praga district of Warsaw resemble wells that are often lacking in or divest of any light or greenery. 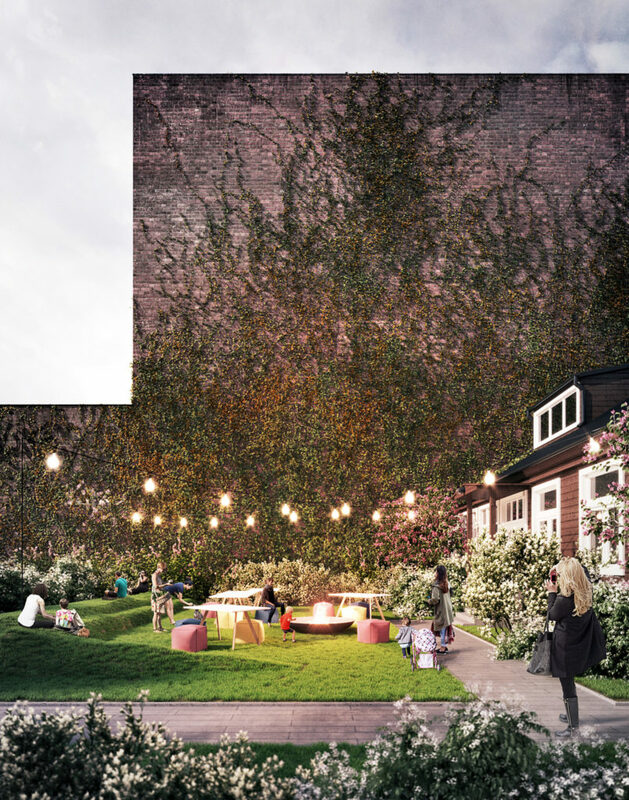 The design therefore aims to create an inner courtyard that would fulfil the function of a garden, with ample foliage conducive to typical yard leisure activities. The creation of an area on Środkowa Street that would harmoniously be shared by pedestrian, bicycle and car traffic carries with it the potential of being an resident-friendly area that is fully accessible to all kinds of social groups, offering an attractive and diverse use programme while retaining full transport and throughfare continuity. The presented design concept was built around improving the conditions for the incubation of social relations in and around the street. The Praga district is currently one of the few places where neighbourly life takes active place in the public space – mainly in courtyard gates and inner courtyards. Extending the area of shared use by the residents and locals to the whole street can also facilitate the further integration of the residents, which is of particular importance considering the regeneration process of the Praga district currently under way. Improving the quality of the space and the image of Praga is also linked to the influx of new residents who should forge a cohesive community with the locals. A strip of tall greenery forming two rows of trees on the western part of Środkowa Street in an area where the distance between the underground utilities is the greatest allows the costs of the plantings to be reduced to a minimum. The low greenery area full of blooming shrubs and tall grasses was positioned on the side of the street with ground floor apartments. The garden strip was set close to the building to raise the comfort and wellbeing of the ground-floor residents, exposing and accentuating the opposite side of the street with street level retail frontage. The specific distribution of tall and low greenery also highlights the historic town houses with the most ornate facades, most of which house retail units – bringing out the best in the Street and allowing it to be perceived as an attractive area with balanced greenery complementing the unique character of pre-War tenements. The proposed spatial plan showcases the publicly accessible ground floors and the historic frontage on the street, while the new location of the low greenery strip exerts a calming effect on the traffic. Transforming the streets into pedestrian and cycle-friendly throughfares is intrinsically linked with the difficult process of reducing the number of parking places, which is usually met with the concern and hostility of the motorised portion of the local residents. Hence, a flexible solution has been proposed where the number of parking places can be adjusted accordingly. The concept envisages 29 parking bays (5 for disabled parking), where the parking area surrounded by greenery is permanent with the bays on the retail side being temporary. The plan is for the number of parking bays to be gradually reduced, transforming them into cafe gardens, parklets or an exhibition area for artisans and artists, steadily enlivening the ground floor and new service point openings. *The base 29 parking bays that was adopted is the number recommended to ensure the street is as user friendly as possible; the design functions can be adjusted to the individual needs and requirements of the residents over time by transforming the greenery area into additional parking bays. The concept assumes introducing one-way traffic on Środkowa Street, running from Stalowa Street to Strzelecka Street. A 5-metre-wide pedestrian and vehicle traffic throughfare has been designed. The planned dimensions for parallel parking are 2.5m x 6m, 2.5m x 5m for perpendicular parking, with 3.6m x 6m and 3.6m x 5m for the disabled parking bays. This has maximised the functionality of the street ensuring that it is exceptionally aesthetic and full of character. Traffic calming solutions have also been envisaged throughout the New Praga District between Targowa, Aleja Solidarności, and 11 Listopada Streets and the planned inner city ring road by introducing a 30 km per hour speed limit and physical speed-reducing measures (tapering the street, emphasising pedestrian priority and introducing ample greenery). The undeveloped area at the junction of Strzelecka and Szwedzka Streets is a highly attractive area for both the new residential and commercial and new public space functions. The close proximity of the metro line can make this a very lively throughfare conducive to interesting urban interactions. One of its functions could be that of a local market supplying local residents with affordably priced fresh produce and products on their way to and from work. The recently built Praga Social Club children’s playground will be retained to ensure efficient use of funds. The picnic and educational area located in front of the wooden house will be a new addition to the spatial plan here. Its grassy surface is conducive to a multi-function use of the plot, perfect for outdoor activities with table seating and even camping and camp fire options. The area was sectioned off from the mini sports ground with a slight slope on one end, forming a natural barrier for balls or the setting for a picnic seating area. The existing space between Środkowa, Kowieńska, and 11 listopada Streets is currently not an area that would be conducive to integration and shared activities, although the presence of retail units and a petrol station makes this a useful and commonly frequented place. The concept assumes scrapping the petrol station and transforming the building into a pavilion with a socio-cultural function, combined with refreshments and meal-making facilities. The facility could combine a commercial (e.g. cafe) function with non-profit activities (a space for conducting workshops, food cooperative space, etc.). The park function of the square between 11 Listopada, Konopacka, and Strzelecka Streets will be maintained. Reducing the width of the road to a minimum accompanied by new tree plantings (located between the underground infrastructure) will allow for an attractive and green square to be created, complemented by mobile elements of small infrastructure like outdoor table tennis tables or games tables. A water reservoir in the form of a shallow pond or fountain will be the central point of the square giving direct access to water in the public space. The ground floor of the building in the northern part of the square will be reconstructed to open up the service point and extend it into the green belt, changing the present pharmacy into a unit where food can be coupled with culture and entertainment (cafe, mother and toddler club, etc.). The two-way communication on Strzelecka Street will be maintained with a cycle lane on the road and pedestrians being able to freely cross the road throughout its entire length. The geometry of the street has been designed to allow two rows of trees to line the road between the underground installations. Low greenery areas and parallel and perpendicular parking bays will be incorporated into the environs. Strzelecka Street will be a lush, green avenue with an abundance of eye-level shrub and grass plantings, creating a friendly space concealing available parking spaces. The choice of suitable greenery fits and complements the busy urban environment in line with the Standards and Guidelines for Shaping Warsaw’s Green Areas. Two tree species have been selected for Środkowa Street plantings – the Red Maple on the pedestrian and vehicle traffic throughfare side – and the Swedish Whitebeam on the frontage side. These trees will give an interesting play of colours in the surroundings, particularly in autumn when the deep red Maple leaves are adorned by the bright red fruit of the Whitebeam. Black Locust trees will be planted in Strzelecka Street giving the street a distinctive character at the time of flowering. Unlike Środkowa Street, this effect will be visible in spring. Low greenery plantings are an important element of the use plan for both streets. According to the design, flowering shrubs and tall grasses are envisaged so as to conceal the parking bays, giving the street a special ambience and charm, especially when in bloom. Replanting and use of existing greenery has also been incorporated. To expand the greenery into the already developed areas, the parking bays and driveways have been designed as mixed surface areas made up of concrete strips and grass with a hardened surface along the wheel axes and in front of building entrances. Środkowa Street is a neighbourhood that is dedicated to the local community. The most significant material making up the street space is greenery. The extensive incorporation of greenery into the street’s makeup has allowed a simple and minimalistic concrete surface to be used as a shared pedestrian and vehicle traffic throughfare, which will play a secondary role in the context of the lush and interesting greenery. The fine breakdown of concrete elements is intended to refer to the cobblestoned surfaces that are so characteristic of the Praga district, while their smooth surface and unbevelled edges will ensure comfortable riding for cyclists and people with disabilities. The lighting in the form of suspended street lamps attached to the tenement façades that running across the street also constitute the “material” for Środkowa Street. The hanging street lamps add charm and character to the street and directly relate to its yard and meeting place function. The street lamp mounting system has been attached to particular buildings that are of the desired height, giving the perfect pretext for the street lamp design to be so free.